CRT and LCD are the types of display devices where CRT is used as conventional display devices whereas LCD is more recent technology. These are mainly differentiated based on the material they are constructed from and working mechanism, however, both are supposed to perform the same function of providing a visual form of electronic media. Here, the crucial operational difference is that the CRT integrates the two processes light generation and light modulation and it is also managed by a single set of components. Conversely, the LCD isolates the two processes form each other that is light generation and modulation. The primary component used in the CRT is the vacuum tube while in LCD it is liquid crystal. The LCD uses shutter effect and also known as twisting of light for displaying images. On the other hand, CRT employs beam penetration and shadow masking methods. Major components Vacuum glass tube, phosphor screen, electron gun, deflection plates. Glass plates, nematic liquid crystal, internal light source. Image flickering Frequently occurs Only occurs at dim light. Limitations Can be easily affected by the external magnetic field. Extreme temperatures levels (high and low) can severely affect the operation of LCD. CRT expands to (Cathode Ray Tube) which uses electron beam (cathode rays) and utilized in monochromatic display monitors. 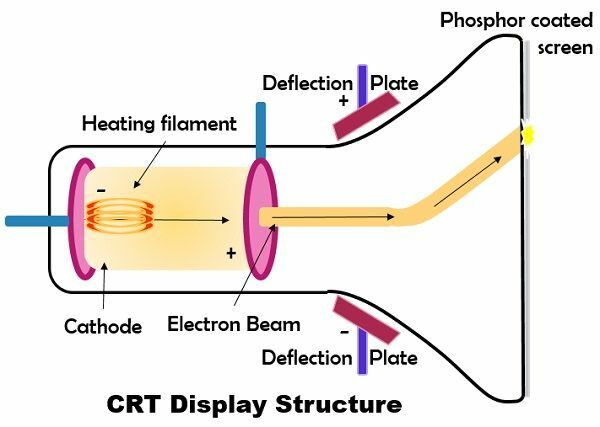 CRT is made up of a glass tube where in one end there exists a display screen coated with phosphor while on the other end connectors are attached to it. Phosphor posses a useful property of light, it can emit light (Fluorescence) continuously for a specific duration when struck by an electron beam. This fluorescence is consistently glowing even after removing the beam which is known as phosphor persistence. The various types of phosphor and variable time period are capable of generating different colours of the light. On the reverse side of the screen, there is an electron gun placed, to emit electrons. The electrons in the electron gun are controlled through the control electrode and forced by concentrating the electrode into the narrow beam at the tiny spots over the phosphor coating. When the electron beam crosses the deflection plates, they are compelled to bend in the horizontal and vertical direction according to the horizontal and vertical deflection plate. The work of horizontal deflection plate is to direct the beam from the left to right then again retracing it from right to left. Similarly, the vertical plate also guides the beam from the top to the bottom and retracing from bottom to top scan line. These deflection plates use electrostatic mechanism while in some cases the magnetic deflection technique is also used in the CRT’s. The displaying image is stored at the memory area known as a frame buffer, and the control circuit is a significant component for producing proper video signals for the display monitor. The colour CRT uses three different electron guns inspite of single electron guns and three kinds of phosphor coating inside the display screen. This phosphor coating is capable of emitting red, green and blue light. 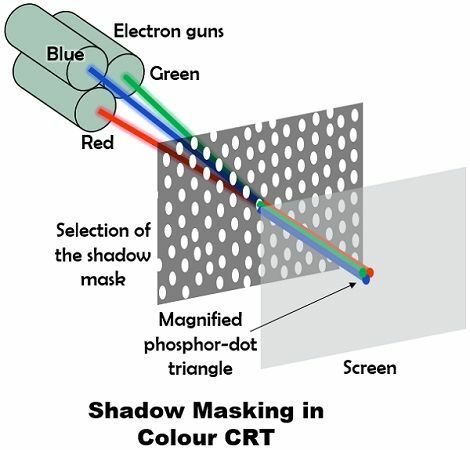 There is a thin metal screen known as shadow mask located in between phosphor coating and electron gun. Shadow mask is engraved with tiny holes which compel the electron beam to hit the corresponding phosphor dots. When the light is emitted the various phosphors mix together and provides a wide range of colours from a particular distance. Now, what is refresh rate? The rate at which the content of the frame buffer transmitted to the display monitor is referred to a refresh rate. The required rate of refreshing for proper functioning is 60 frames per second or even more than that. The flickering effect is one of the major demerits of the CRT’s which causes due low refreshing rate. The low refreshing rates rise the inability of integration of light impulses from the phosphor dots into a stable picture. Another major issue in CRT is that the phosphor persistence of monitor must be accurate, sufficiently long for a frame to retain the visibility while short enough to fade prior to the next frame is displayed. LCD (Liquid Crystal Displays) are categorized under the non-emissive displays as it uses optical effects to transform the light into graphics pattern. It renders the pictures on monitors by passing the polarized light from the atmosphere or internal light source across a liquid crystal material which can completely allow the light to transmit or block it. Here the meaning of the liquid crystals is associated with the liquid characteristic of the molecules even after being arranged in a crystalline structure. These are the flat panel displays usually uses nematic liquid crystals, where the molecules align in free patterns. These are constructed by the two glass plates each containing a light polarizer positioned at 90° degrees to the other plates sandwiching the liquid crystal material. The rows of horizontal transparent conductor and column vertical transparent conductors are arranged in the two distinct glass plates where their intersection specifies a pixel position. 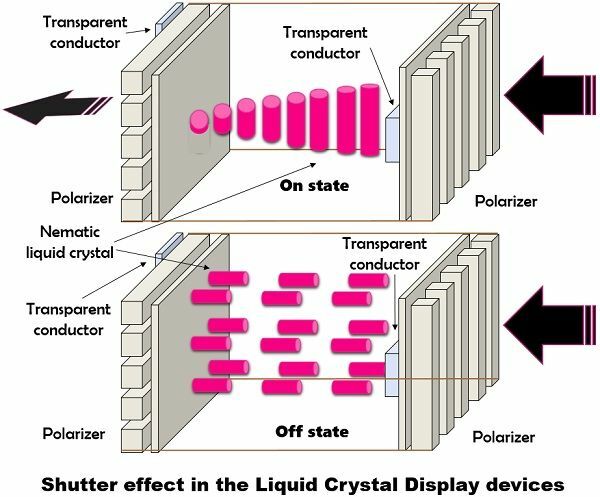 The alignment of the molecules in LCD is shown in the diagram given below where in the “on state” the polarized light surpassing the material is tilted at 90 degrees making it possible to be passed through the opposite polarizer. After that, the light is reflected back to the viewer. For switching off the pixel the voltage is applied to the two intersecting conductors to align the molecules causing 0° degrees of rotation. Similar to CRT, in LCD’s also a refresh buffer is used to store the picture definition and provides a refresh rate of 60 frames in each second. It also provides backlighting with the help of solid-state electronic devices, so that it could not wholly rely on the external light sources. In LCD’s to present colours a triad of colour pixels is placed at each pixel location which is formed using different materials or dies, these are known as passive matrix display. In some cases, the LCD is constructed using a transistor, here the primary task of the transistor is to regulate the voltage at each pixel positions and preventing the leakage of charges from liquid crystal cells. The cost of CRT is low due to the popularity of LCD, the use of CRT had been extremely reduced while LCD can be purchased at a higher price as compared to CRT. CRT consumes more power than an LCD. Flickering issue is majorly experienced in CRT. As agaisnt, in LCD the flickering only occurs at the dim light. The equipment used in CRT to form image is the electron beam. On the contrary, the liquid crystal is the major component of LCD in the formation of the image. CRT provides good response rate of less than 1 microsecond while LCD offer high response rate of 1-8 millisecond. The resolution and image retention of LCD is higher relative to CRT. LCD’s are available in compact sizes. Conversely, the size of CRT is larger and covers wide space. CRT is the older technology which also has flaws such as image flickering, high power consumption, low resolution. However, these are still in use in some places. On the other side, LCD is newer technology and has eliminated several limitations of CRT’s, but still, CRT response rate is better than LCD.